Patty's Utopia: Do You Remember “El Paladar Cubano” in Seattle? Do You Remember “El Paladar Cubano” in Seattle? Perhaps you do. It used to be a food truck located on Aurora Ave N and 90th St. in the Greenwood neighborhood. Many of us were deeply saddened when the owner closed it in 2010. Thankfully, because of popular demand, he decided to come back and open a nice, small restaurant in the SODO neighborhood. The new incarnation of that awesome food truck is now known as “Café con Leche”, located at 2901 1st Ave South, Seattle. The moment you enter this place, the atmosphere transports you to a different dimension, one filled with percussions and pictures of Cuba. Pedro Vargas, the owner of Café con Leche, is a magnificent Cuban musician and a great host. His food is absolutely delicious, authentic and as if this wasn’t enough, he decided to add live music to this little piece of his homeland. You see, in many Latino countries, music is a huge part of our culture. If some of you have gotten the pleasure of visiting Cuba, or any Latin American country, you've probably noticed that music is played in almost every corner in any city. I had the pleasure of attending their first night of live music this last Tuesday, and while I was talking to Mr. Vargas he shared his vision of having different groups every Tuesday to offer a variety of sounds to his patrons. Wonderful idea, I think. 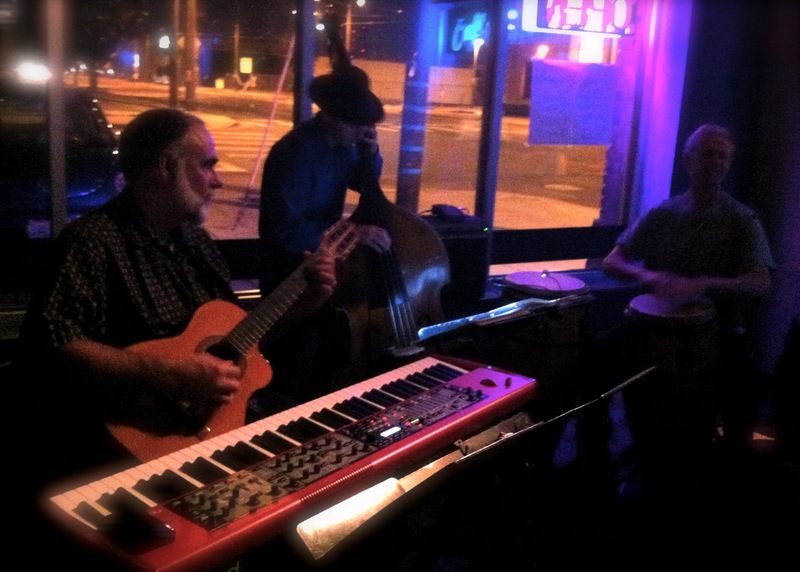 The Fred Hoadley's Trio was playing that night, and they delighted us with wonderful pieces of Latin jazz that kept me smiling through the entire evening. Can you imagine how amazing it is to have an authentic Cuban dinner while listening to some of the best Latin jazz musicians in Seattle? Yes, I was in heaven! So now you know my friends. If you are looking for something different in flavor, I encourage you to visit “Café con Leche”. You will not regret it. Yes, I think I am at the right place. The Cuban humor welcomes everyone! I started my dinner with an order of "tostones". My second dish was "Pan con Lechón". This is only half of the regular size. 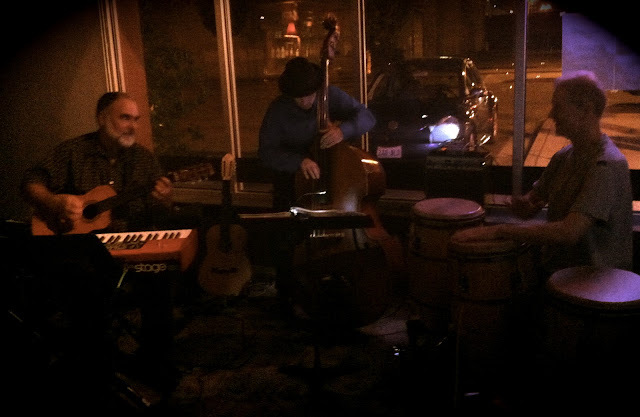 From left to right: Fred Hoadley on Tres/Piano, Ben Verdier on Double Bass, and Tom Bergersen on Congas. 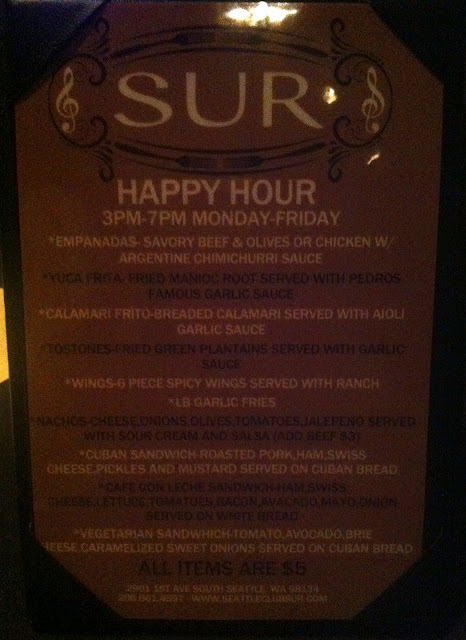 Café con Leche offers a very nice Happy Hour too! Labels: Entertainment, Food, Hispanic, Latin America, Latin music, Latino, Music, Seattle. Looks great! I wish I were closer! Hispanic Heritage Month In Seattle.